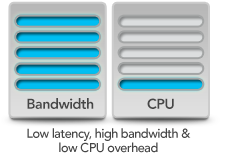 Increased demand for greater data transfer speeds and more bandwidth over shared networks, plus the need for HD video editing support on high-performance shared storage systems has driven the explosion in demand for 10 Gigabit Ethernet (10GbE) networking—offering ten times the performance of Gigabit Ethernet, the most common wired network connection today. It’s no wonder. And yet, most computers aren’t equipped to get you connected. If your computer has a Thunderbolt™ 3 port, you are in luck—Sonnet’s Twin10G™ Thunderbolt 3 Edition dual-port 10 Gigabit Ethernet adapter is the powerfully simple and cost effective solution for adding blazing-fast 10GBASE-T 10GbE network connectivity to any Mac® or Windows®(1) computer with Thunderbolt 3 ports. The Twin10G Thunderbolt 3 Edition adapter is equipped with two RJ45 ports, enabling it to connect to 10GbE infrastructure via inexpensive CAT-6 or CAT-6A copper cabling at distances up to 55 or 100 meters, respectively. How simple? Just connect the Twin10G Thunderbolt 3 Edition adapter to your computer via the included Thunderbolt 3 (40Gbps) cable, download and install a driver, connect the adapter to the network switch or directly to 10GbE-enabled storage via CAT-6 or CAT-6A cables, and configure the adapter’s settings through the macOS® Network control panel or Windows Device Manager. The Twin10G Thunderbolt 3 Edition adapter is compact enough to easily fit in most workspaces, yet large enough to support proper airflow inside the case—its design enables the adapter’s temperature-controlled, variable-speed fan to keep the adapter running cool and whisper-quiet at all times, making it suitable for use in noise-sensitive environments. Constructed of rugged and lightweight aluminum, the adapter’s outer shell securely protects the inner circuitry. 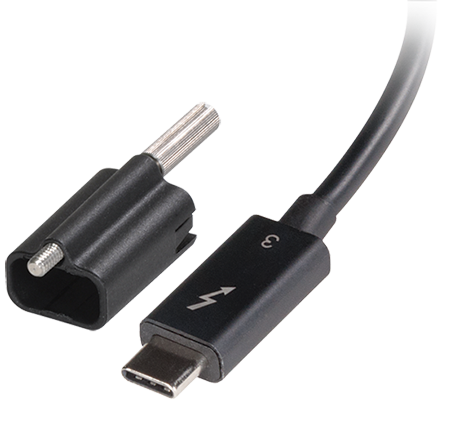 The Twin10G Thunderbolt 3 Edition adapter includes two Thunderbolt 3 ports; the first connects the adapter to your computer, while the second supports daisy-chaining of up to five additional Thunderbolt peripheral devices(4) to a single port on your computer. The Sonnet adapter includes 10Gbps USB 3.1 Gen 2 support, meaning you can connect a USB device(5) to the second port using the proper cable or adapter. The Twin10G also provides full support for connecting two 4K displays @ 60Hz or one 5K display @ 60Hz(6). For connected devices requiring extra power, 15 watts is provided to connected bus-powered devices(7). The Twin10G Thunderbolt 3 Edition adapter includes a 0.5-meter Thunderbolt 3 cable to connect to your computer, and a Sonnet ThunderLok 3 Thunderbolt connector retainer clip(8) to secure the cable to the adapter. Sonnet’s ThunderLok 3 helps prevent accidental cable disconnects that can lead to data loss, securing the Thunderbolt cable to the adapter. ThunderLok 3 is easy to install and use—just slide it over one of the cable’s connectors, plug in the connector, and then secure it to the adapter by turning a thumbscrew. Because ThunderLok doesn’t attach to the connector, it remains on the cable and won’t get lost when not in use. Switch/router must support link aggregation (teaming), and ports must be configured for link aggregation. Windows 10 teaming requires Creator's update, version 1703 or greater. Feature to be added in a future firmware release to support Windows.